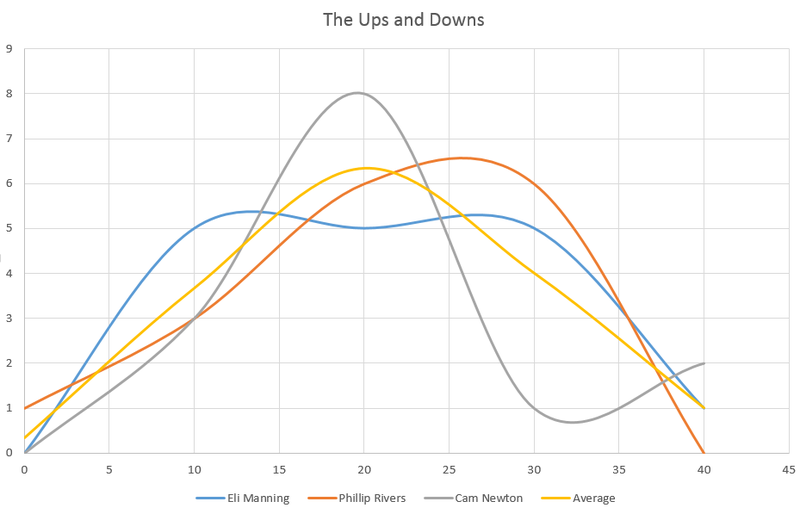 I saw a really interesting article on FiveThirtyEight.com about cluster analysis for quarterbacks based on QBR ratings. I found it so interesting I wanted to recreate it for fantasy. 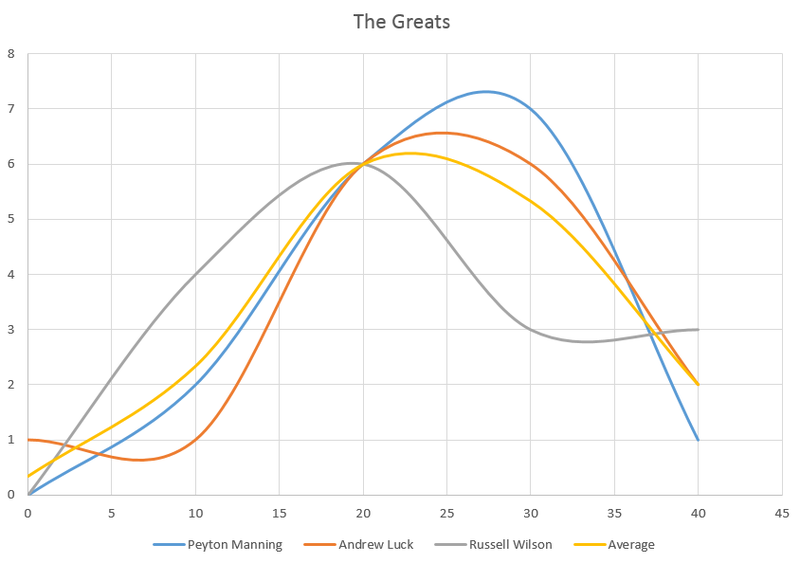 I looked at all the projected starting QBs for 2015 and their 2014 game scores (standard scoring) and tried to break them up into similar groups. 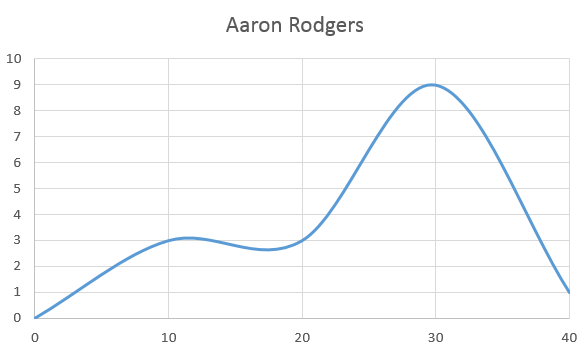 I lumped them into tiers and created graphs to compare the distribution of their game scores. You can find them in the URLs that follow each heading. For clarification, each number on the x-axis shows the amount of scores below that number. However, “40” includes Roethlisberger’s 40+ point game. These quarterbacks were either injured for the large majority of the season, couldn’t keep hold of the starting job, or are projected rookie starters. 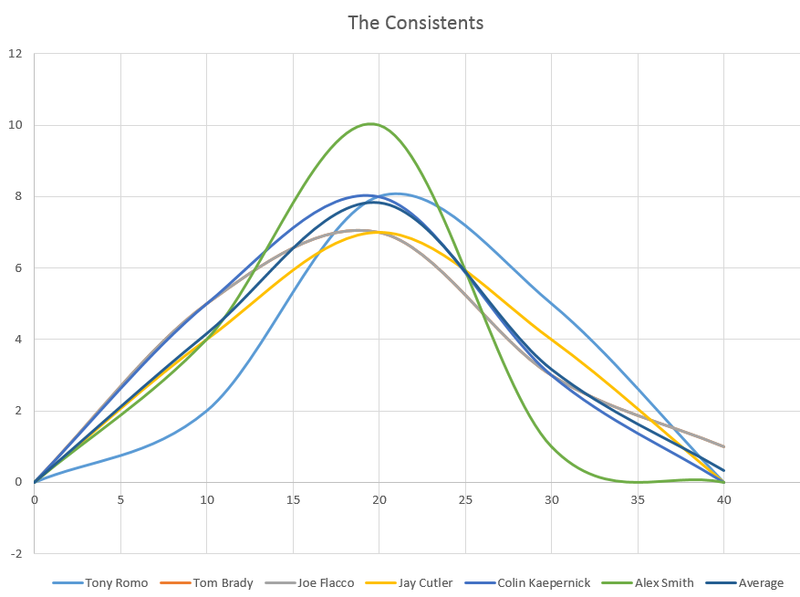 Nick Foles, StL (Didn’t play double digit games, but landed in the Consistents). I’ll start from the top and go down. The #1 guy shouldn’t be a surprise. Not surprising at all. If you look at his scoring distribution, he outclassed everyone with 20+ point games coming in with 10. Don’t need to say a whole lot here. If you weren’t fortunate enough to have Rodgers, hopefully you had one of these three. Two shouldn’t be a surprise, but one might be. Luck and Peyton have been compared ad nauseam, and it doesn’t end here. However, this project I did only helps the case that Seattle fans have known all along: Russell is elite, too. While Russell has only half the 20-30 point games that Luck and Peyton did, he has as many 30+ point games as the other two did combined. Russell shows flashes of boom-or-bust, but his booms are so impressive that he has to be considered here. These guys are not bad to have either. They aren’t the focal point of your lineup but they certainly can make the difference in a competitive game. While Ben gave us that incredible game against my lamenting Colts, his scores were weight pretty heavy towards the middle. Ryan had a similar story. 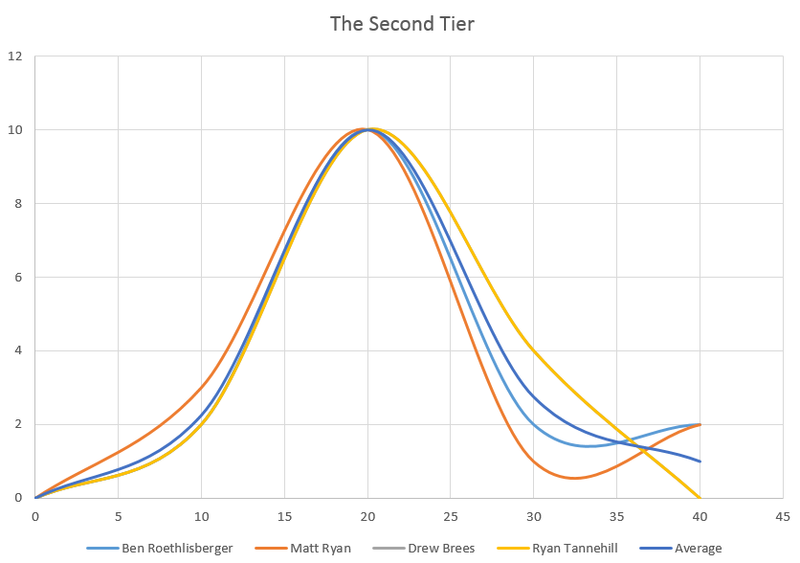 Tannehill and Brees had identical distributions which is either promising for Tanny or upsetting for Brees. These guys will either make you jump for joy or tear your hair out. They will post amazing game scores, or drop single digit…or even negative…game scores. Understandably, this is the most populated list of quarterbacks. These guys will pretty consistently churn out scores in the teens, and may surprise you with some 20s. These guys are consistent, but aren’t posting the same quality of consistency. They’re going to give you a healthy spattering of single digits along with teens. 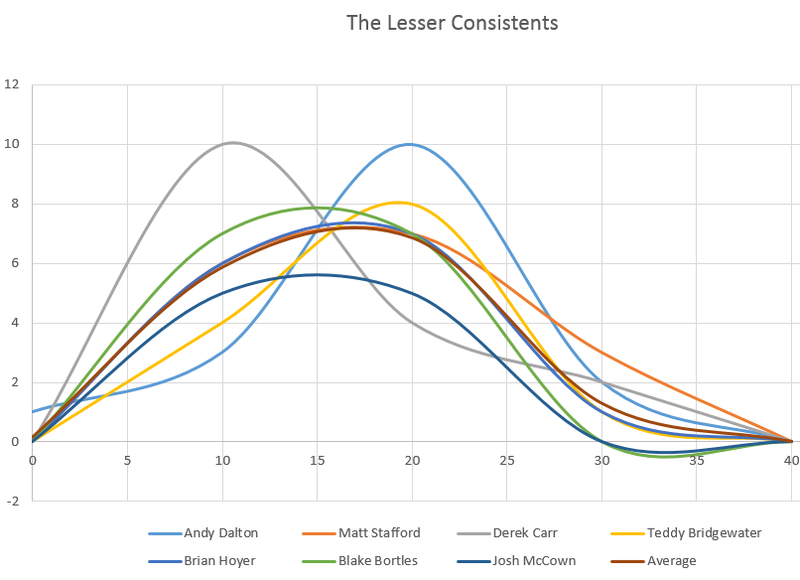 Andy Dalton and Derek Carr are the bookends on the graph with steep peaks at teen scores and single digit scores respectively. That could probably be explained away by considering their personnel (Dalton with a superior supporting cast to the rest of the group whereas Carr has a rather inferior supporting group). 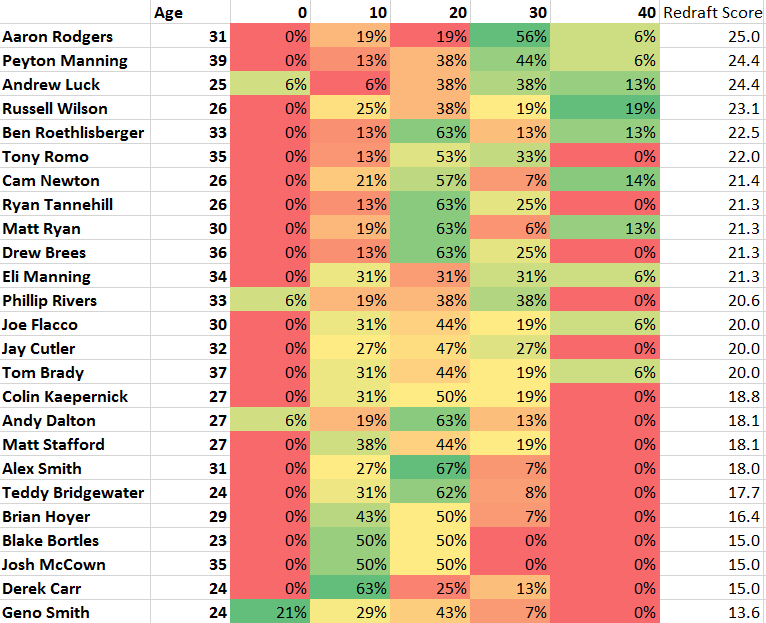 Stafford surprisingly makes an appearance here, but should probably be considered an outlier than an indication. I tried coming up with a clever name for this “group”, but I figured it didn’t really need it. Just take a peek at the graph. 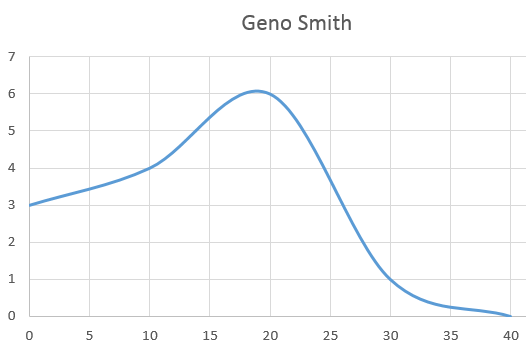 This is all well and good, we see that if you miss out of your guy, there is probably another one who will serve just as well (unless you want Rodgers…or Geno, if you’re into that sort of thing). But if you’re wanting to see a top to bottom ranking, you could always go look at your fantasy football history page. Or you could look at my colorful chart! The “redraft score” was calculated by turning everyone’s absolute numbers into percentages. I then made a weighted average (big games being the heaviest weight) and turned that into a single score and multiplied it by 100. For reference, 40 is the highest score for a quarterback. Now, a few caveats are important to make. This doesn’t take into account any injuries, teammate’s injuries, coaching changes, etc. I didn’t quite know how to account for any of that, but I also felt that the analysis stood pretty strongly without considering those anyways. Previous Previous post: How dare you, Tom Brady?